When evaluating the market of sales configurators, it is important to ask “How do I want to do business?” and “Will this tool act as an enabler?”, rather than be constrained by current processes. Today, the hard boundaries between off-the-shelf solutions by different vendors, legacy software and proprietary in-house development are becoming blurred. To make sure you don’t get lost in the blur, when choosing a product configurator, you should understand the nature, core features and other features that might impact your decision. Needs analysis – Are you able to specify the requirements of the customer in your own terminology? Product/service recommendation – Are you able to guide the customers to products or product lines based on the needs analysis? Constraints – Are you only able to select one feature or option excluding others? Dependencies – Are specific features automatically selected when they are dependent on another feature? Calculations – Does the configurator have mathematical functions? Pricing Configuration – Does the configurator allow you define the pricing and discounting rules backed on customers, geographic locations and product lines? Module selection – Can the configurator automatically match the customer requirements to specific modular parts, products and services? Structured output – Is the configurator capable of generating structured outputs, such as configured bills of materials, based on the modules selected, while avoiding combinatorial explosion? Document Output – Is the configurator capable of generating configured reports and documents in varying formats such as Word, PDF or HTML? System configuration – Does the configurator allow you to share common requirements, calculations, etc. across multiple configurations to supply a complete system? Process selection – Are you able to configure process components, such as production routings and project elements? GUI screen builder – Does the configurator allow you to deploy and customize the end-user screens? Visualization – Does the configurator link to drawings, schematics or interactive visuals representation? Default configurations – Do you have the ability to predefine configurations as starting points for specific customers, geographic locations, industries, etc? Multi-language – Are you able to easily deploy prompts and screens in multiple languages? Process flow definition – Does the configurator allow you to have different users with different process paths? Security – Does the configurator allow different end-users to be limited to certain functions within the same configuration process? Before searching the software market for configurator tools, it is important to carefully consider some key questions and features that your business is looking for in a configurator. At the strategic level, it is also important to identify the primary objectives and vision of the overall project, before being bombarded by supplier information. 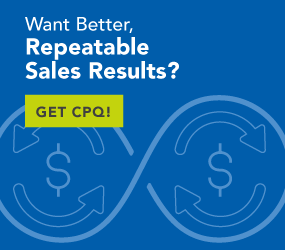 To learn more about how product configurators can increase your advantage, download the white paper, “A Manufacturer’s Guide to Operating Lean with CPQ”. Find out how top senior executives are harnessing CPQ technology to leverage lean and the impact it’s having on their businesses.